The next couple of scrumbles. I thought i'd make some spirals. I visited Newgrange in Ireland some years ago, and was blown away by the spirals carved in stone. Top left: the spiral of Newgrange. They are believed to be Celtic, but were already there 2500 years before the Celts came to Ireland! 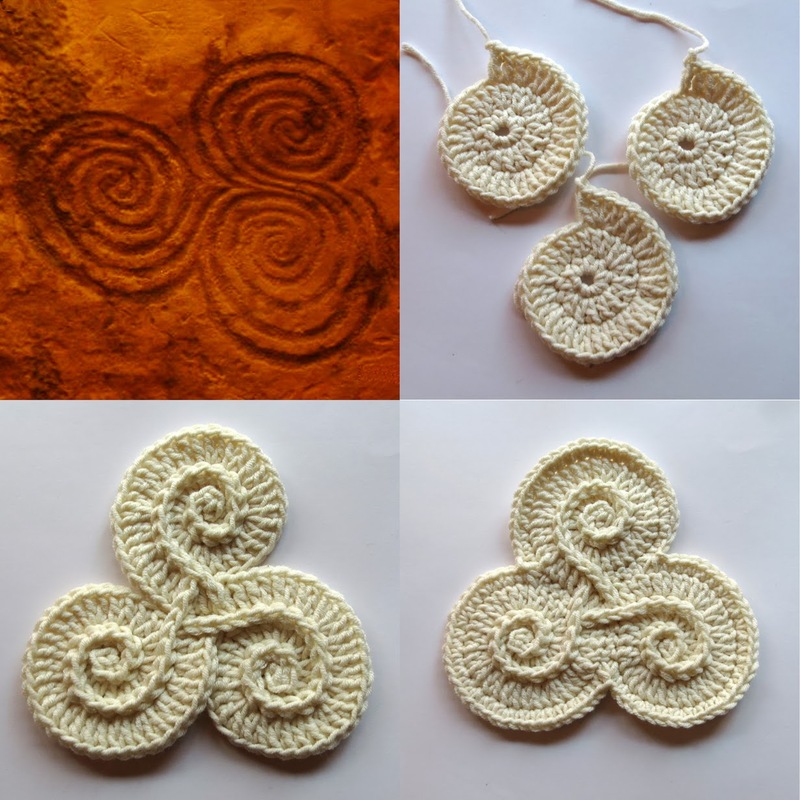 Top right: three separate spirals crocheted. Bottom left: the spirals connected with surface single crochet. Bottom right: the scrumble is finished. Peace symbol. Top left: The symbol. 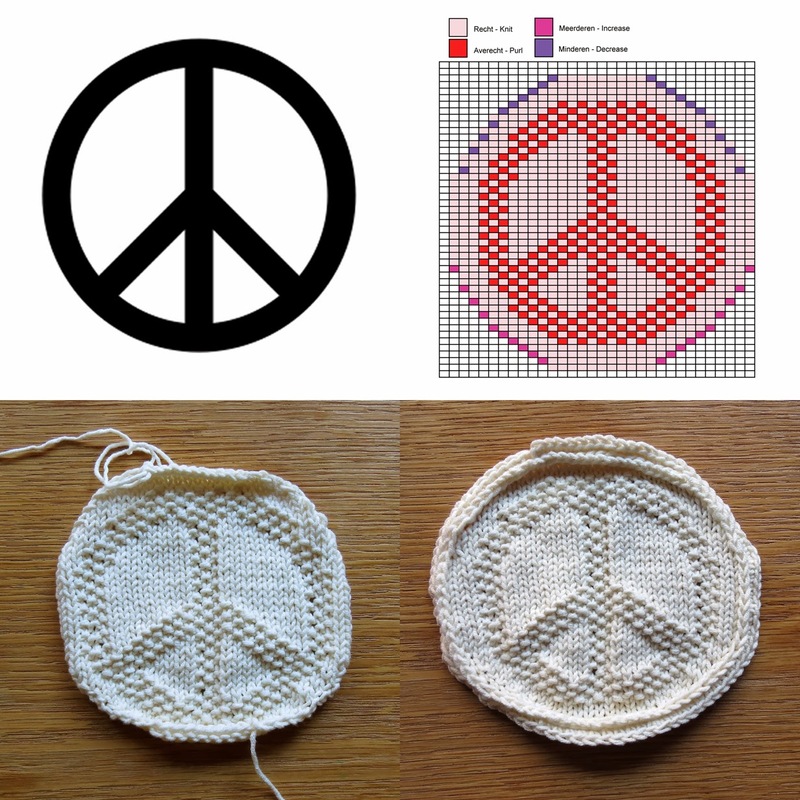 Top right: the chart i designed in Illustrator for the knitting of the symbol, for those of you, who would like to try it. 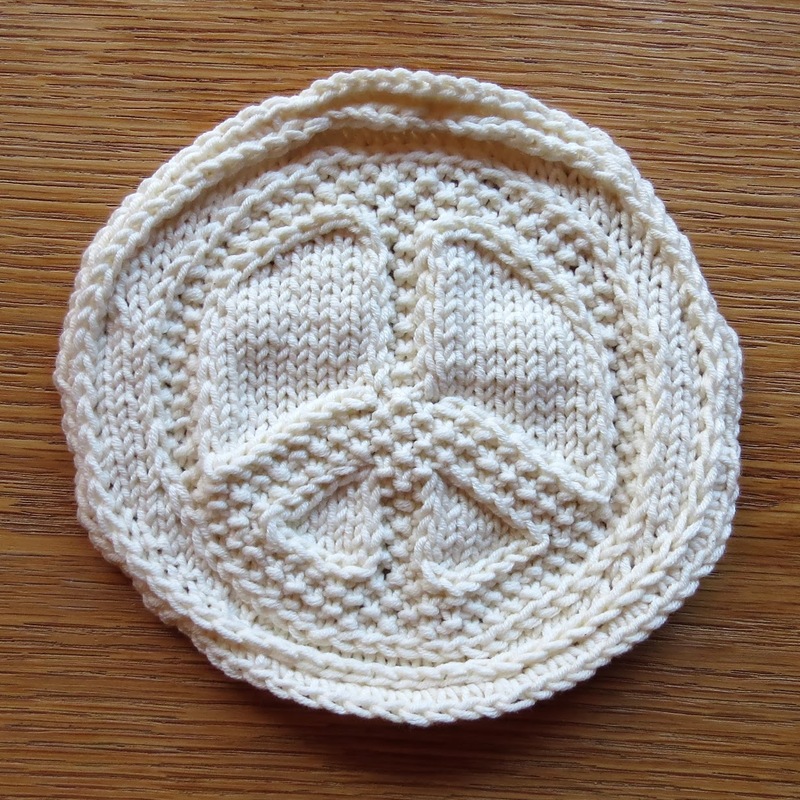 You can knit either in a single circle or in a larger knit project. Bottom left: the knitted scrumble. Bottom right: crocheted surface single crochet to enhance the outside. Not really satisfied with it. Some alterations by means of yet more surface single crochet to outline the inner parts of the sign. Still not happy:( I hate the curling of stockinette stitch! I think i will frogg it. And so i did, this the R.I.P.ped peace symbol turned into a peacock feather. The symbol stands for beauty, dignity, immortality and rebirth. Top left: the inspiration. Top right: the 'eye' is made of bullion stitches. Around that i build the shape with single crochet, half double crochet, double crochet and some triple crochet. Embellished with surface single crochet. Bottom left: The edge is all on the backloop crocheted single crochets. To get the curves i crocheted short rows, meaning 2 or 3 rounds starting at the same place. Bottom right: the feather all done. For a better profile some more surface single crochet. The paisley symbol. It stands for fertility and good luck. Top left: the henna drawing. It is a very inspirational drawing, it almost looks like a crochet chart on its own. 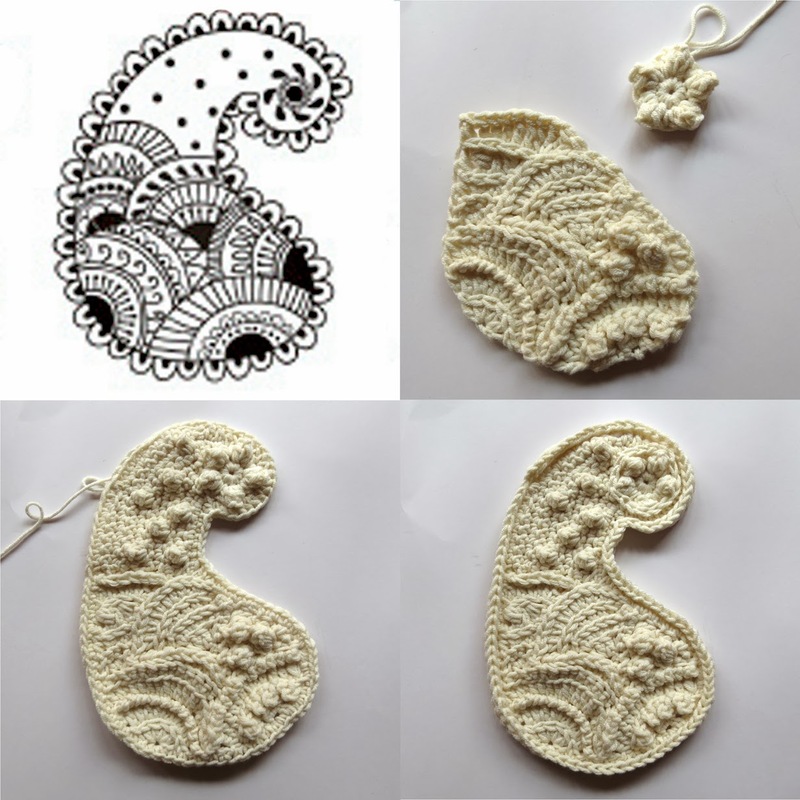 Top right: the parts that stand out the most crocheted with a variety of stitches, and embellishes with surface- chains, -single crochet and picots. Bottom left: the connection is crocheted with single crochet and clusters. Bottom right: all done. 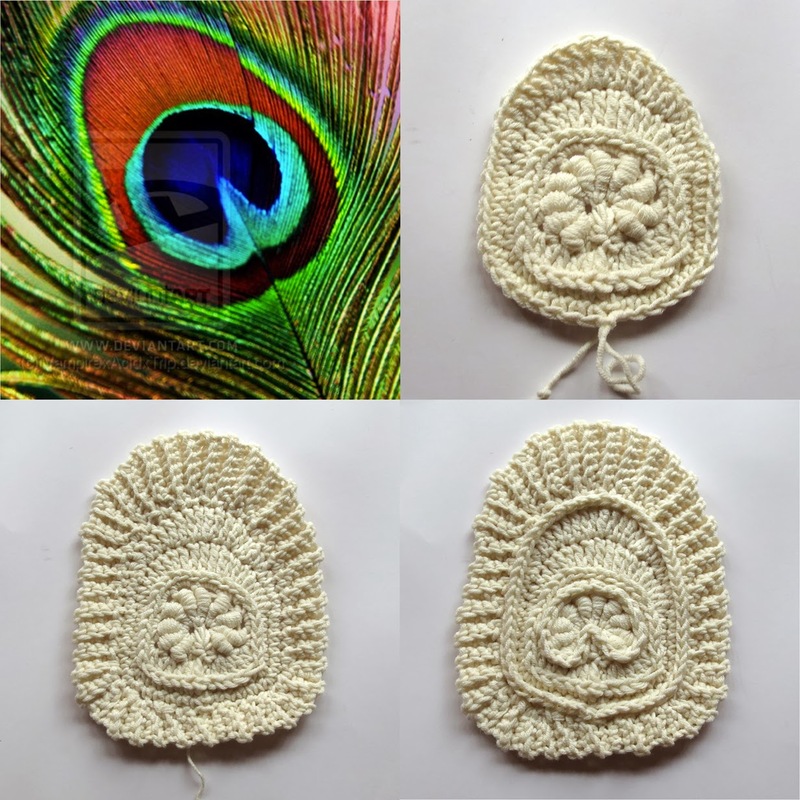 The 'eye' and outside are embellished with surface single crochet. I'm very happy with this result. Absolutely LOVE the top spiral piece! So do i! Gorgeous hanna drawn symbol! Great ideas for joining scrumbles - thank you!